Here’s some video footage of the rescued cowfish we met a while back, swimming around in his new home at the Aquarium’s seahorse exhibit. Watch the way he swims; cowfish have hard, bony armor surrounding their bodies that keeps them from turning and flexing the way many fishes do. They move by fluttering small fins that extend out of their armor, so although they’re very well-protected, they’re not particularly quick or maneuverable. 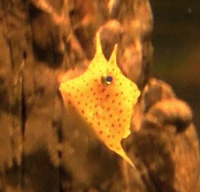 At one point in the video, the cowfish ties to catch up to one of the mysid shrimp that are sprinkled into the exhibit for the seahorses to eat. The fact that he has some trouble catching up to a frozen shrimp is evidence that swimming isn’t his strong suit, although the fact that he picks a shrimp that’s almost as big as he is also doesn’t make things any easier. You do have to admire his heart. Bark Worse than Their Bite? Tropical Fish in Rhode Island?